Circus of the Spineless: Intro to The Circus of the Spineless! A monthly celebration of Insects, Arachnids, Molluscs, Crustaceans, Worms and most anything else that wiggles, crawls or flutters. Intro to The Circus of the Spineless! Circus of the Spineless is a joint project of Bootstrap Analysis, Urban Dragon Hunters and milkriverblog. 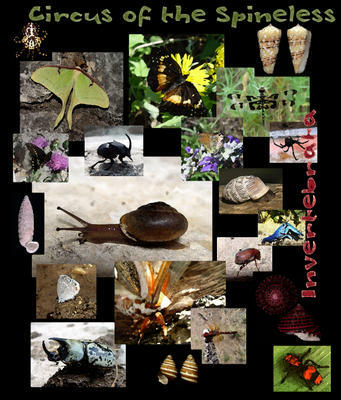 Thanks to Bootstrap Analysis, who was first to suggest a carnival of blogwriting about invertebrates, here we are. I've put some research into the idea of carnivals (especially in terms of getting recognition and links -- since my concept is that you want to get the word out so people will READ the posts). In that regard i've found a few opinions that one of the important things to attract both readers and linkage is to have a name that is a) catchy and b) descriptive. Bootstrap originally suggested the excellent name An Inordinate Fondness. I really liked that, but my thinking has changed somewhat since that was proposed (besides they may want to use that name for a personal project!). I have seen some carnivals named such that only insiders seem to know what they're about -- hardly a formula for getting a potential audience to bite. So, with that in mind i wanted to name this a "carnival" or a "circus" of something. And one of the first thoughts i had was "the spineless" -- it's descriptive, edgy, provocative, and more than a little nuanced. Maybe it'll work, maybe not, but here goes. I also have had the experience of hosting I and the Bird and of submitting to The Friday Ark, and am prepping now for The Tangled Bank, and have tracked the effect of those carnivals on my blog. That's led me to try to refine some of the methods for producing a carnival. To that end i'll be adding a number of "hosting" posts to this site (see the sidebar) as tutorials for those who would like to host and need some guidance. Hope you like the idea, and are willing to contribute. It will be a monthly carnival, it will travel host to host, we'll keep permanent links to hosts here, and i'll always post a summary on this blog. Upcoming is a list of rules for submissions. Welcome to the Circus of the Spineless 2.0. This blog carnival was started in 2005 by Tony G and Nuthatch. In 2009, Kevin Zelnio took over the administration of this carnival. Please contact kzelnio at gmail dot com to inquire about hosting or if you have any questions! The News You've Been Waiting For . . .